So as you may know already Veeam was always going virtual only, therefore each customer that approached me to find him a solution for their 99% virtualized environment cornered me a little. When we started talking about their NAS at first it was much convincing why moving back from storage NAS services (e.g: NetApp CIFS, EMC VNX Celllera etc) to Normal Windows 2012 File server services would be a better approach for them from an Infrastructure perspective . Of course all of this is per customer environment but I’m talking in small NAS less than 5-6TB. I’m not a Microsoft expert but I can point out enough advantages of why going with MSFS will be a good choice for them regardless of going with Veeam. Suppose this was the easy task, now what’s left is what are we doing with the Physical servers?! The approach until now was staying with the traditional backup software for continuing Agent backups on the servers which did the job. But managing two software’s, two repositories and not mentioning how do we backup up all of them to tape?! Last week I faced such a customer and I saw the same thing, although this time I hesitated at first but because his physical environment was only with Windows servers 2008 R2 and above (NOT RELEVANT FOR LNX) it gave me an idea. 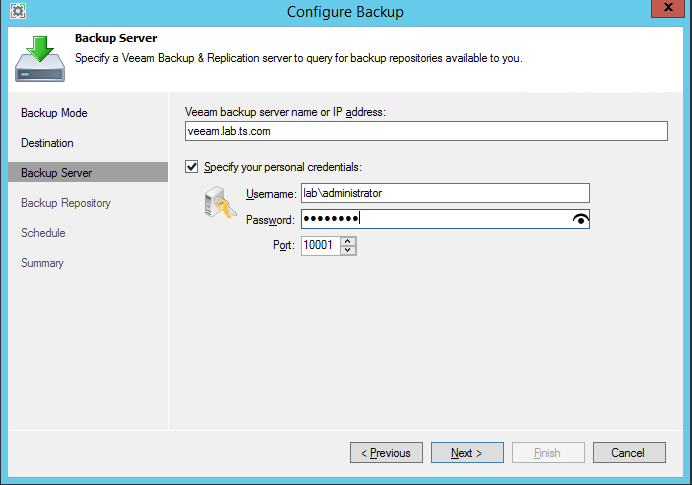 Why not going with the Veeam Backup Endpoint Free (VBEF) for their remaining physical servers. One of the servers was a domain controller although he has also a virtual one and one of the SQL Databases was physical also. So basically what I’ve done is quite simple, after I downloaded the software from Veeam website and installed it on each physical server I wanted to backup. The backup per client is the same as with all Veeam B&R backup jobs, just needed to configure that the repository is one of the existing repositories in the Veeam Backup & Replication environment and that’s it. Before installation finishes it will ask about “Backup Target” choose to skip this phase we will do it later. e if you go to the “System Tray” and look for the icon of VBEF which is currently “Unconfirmed”. After Double Clicking the Client it will pop-up the configuration wizard which will shows us three ways of backing up the client. Entire Computer – its means it will actually backup the entire image of the client and will allow to restore the image as a whole. 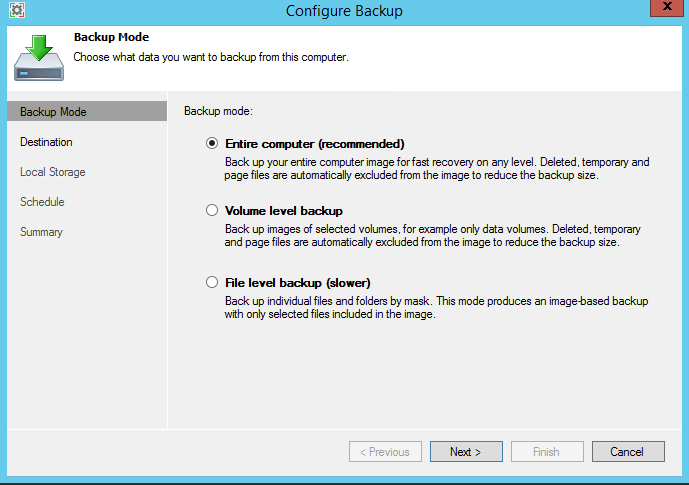 Volume Level Backup – Backups image of entire volumes you choose in order to backup only data volumes without system one. File Level Backup – Backup of client in a file level approach which means that any folder or file could be chosen for it. This also is what is needed in order to do an Item-Level restore from the backup because it uses the MS-VSS mechanism on the clients. We will go with “Entire Computer” backup which will include all data we will use after. We will go Next and see that now we will choose where to backup our client to. Local Storage – Any storage attached device that the local OS sees is possible to be a target. 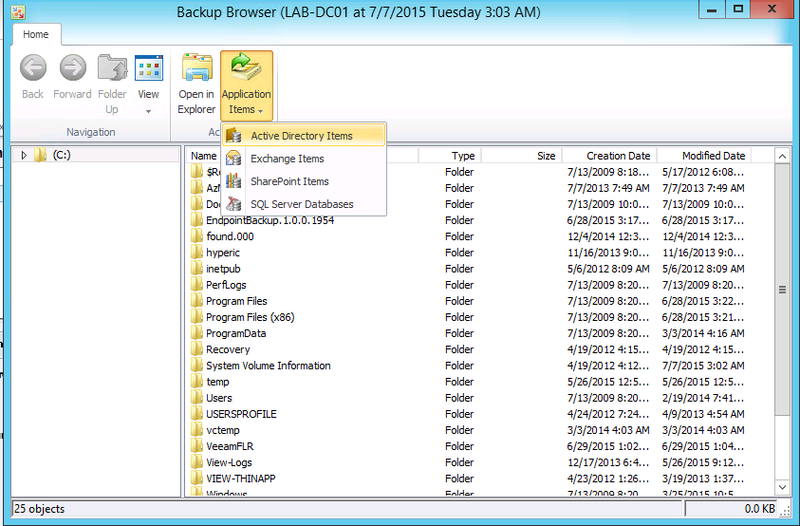 Shared Folder – We can backup to any network folder which has SMB services like Enterprise NAS or MSFS. 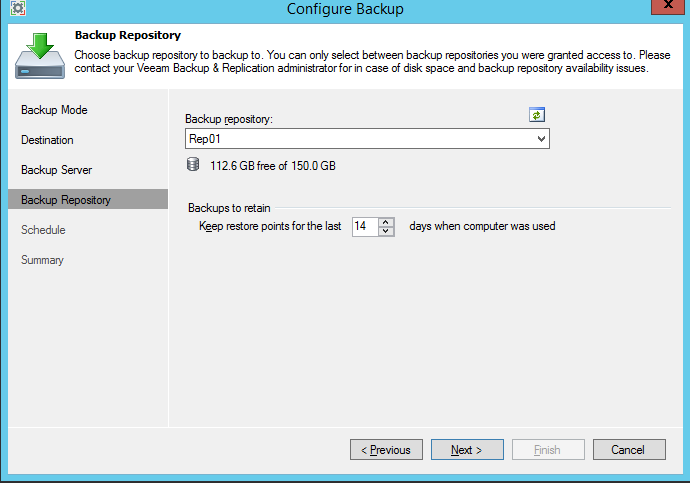 Veeam Backup & Replication Repository – This is the most used method if you already have a Veeam B&R environment which adds the backups to the existing repositories which helps to manage only a single repository and elevates all other capabilities of Veeam B&R (Supported from Veeam Backup & Replication v8 U2). 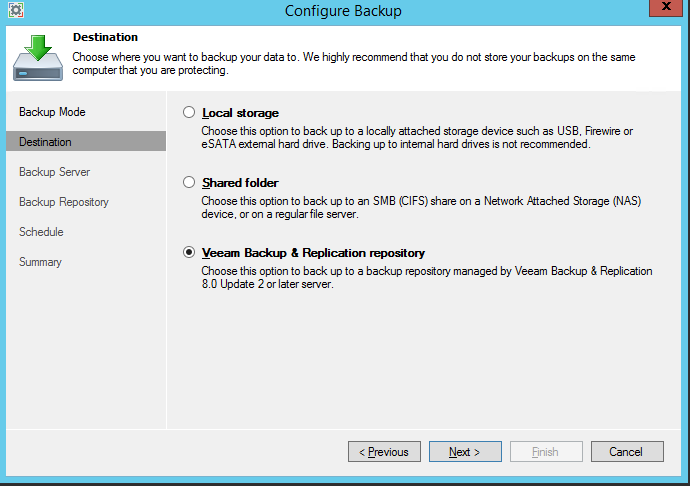 After choosing of course the recommended repository “Veeam Backup & Replication Repository” we will go to the Next screen which are the information and credentials of Veeam Backup Server. There is not much to elaborate here so only put in information and press Next. It will now connect to the server to collect information and verify connectivity to all relevant services. Now we are able to choose the destination of the backup files which are one of the already configured Repositories in your Veeam B&R server (Note: Trough the Veeam B&R you should verify there is permissions on the repository itself). You only need to choose one of the wanted repositories and choose the restore points you want to keep on disk. After doing so choose Next so we can schedule the job itself. In the Schedule window it’s a bit confusing if you see it at first, but when you think about it quit make sense. 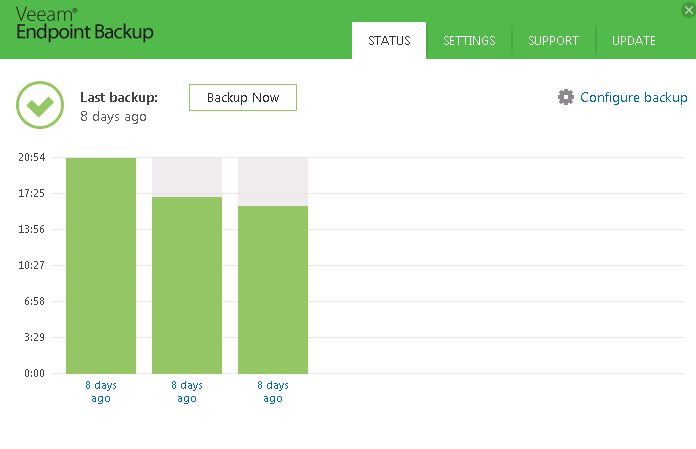 Veeam Backup Endpoint Free is firstly developed for clients (Laptops, PC etc.) which are not always in a Powered On state. Therefore with the VBEF Client we can take the physical client from sleep mode or start to backup. 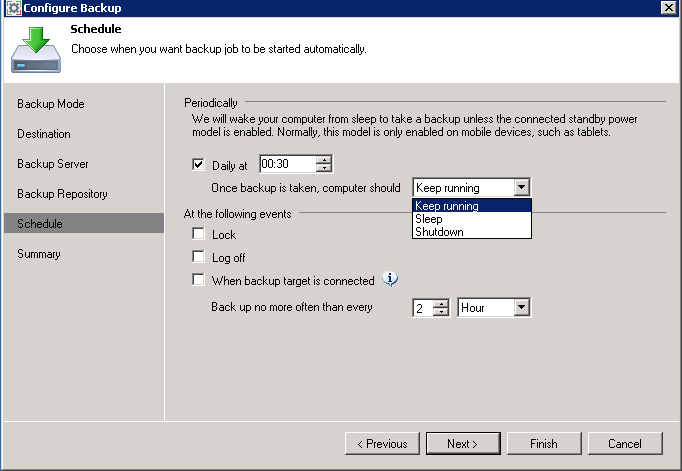 So when you look back on the Schedule window you can understand that after backup is finished we can return computer to Sleep Mode, Shutdown Machine or keep running. In our case and all Server scenarios it should be “Keep running”, Choose Create if it’s a new client or Next if it’s a modified job, and select the V of the “Run the job when I finished”. You will see now the backup running in the screen of the VBEF Client, Once finished you should will see the client Graph showing the time it took for the backup. Once you click on the graph itself you can see what actually happened during the backup task itself. Ok, so it was a little more than I wanted initially to elaborate on the process of Veeam Backup Endpoint Free but now we are getting to what can be done with the data backed up that I was very surprised with. When you go to Veeam Backup & Replication Console you will see of course immediately something new in the Jobs pane which is “Endpoint Backup”, each Physical Server will be a Single job. Now, in order to restore files or application aware-items (Exchange, AD & SQL) we will go to the restore sections and select “Endpoint”. We will see two endpoint restore options. We will go forward with the “Guest files (Windows)” option but I want to point out that I’ll write another small post just on the “Export disk content as virtual disks” option with showcase of them. So the “Guest Files (Windows)” wizard is a straight forward based on the normal “File Level Restore” wizard. It will ask us which endpoint we want to restore from so I’ve selected our database in my case. After that we have to choose from which restore point to restore from which in our case is only the latest full backup one. Finish the Wizard and it will mount us the disks from the backup files and load up the “Veeam Backup File Restore Explorer” which now allows us to restore individual files as we usually know how to do on Virtual machines also. 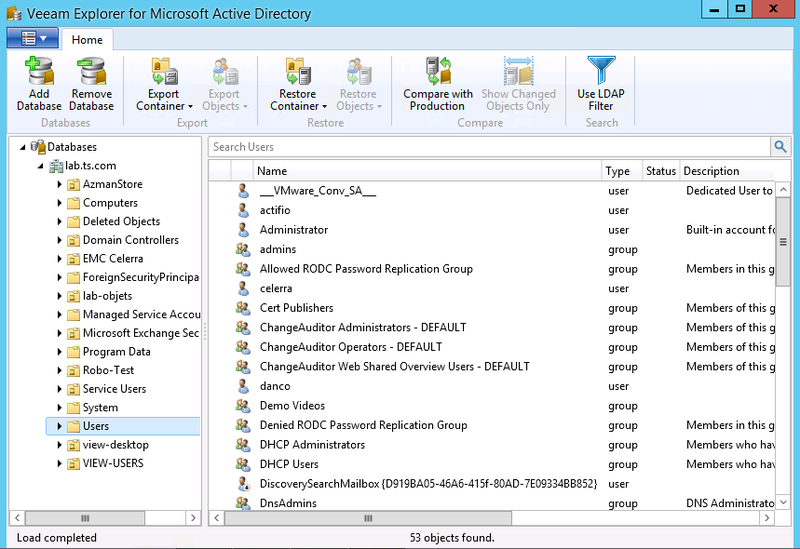 But the coolest thing here is that you can now through this explorer mount the “Veeam Explorer for …” and to restore application items from “MSSQL/MS AD/MS Exchange”. In our case we will load “Veeam Explorer for AD” because it’s an AD server. After the “Veeam Explorer for AD” is loading we can do any day-to-day item restores we did also before with virtual machine DC. I don’t believe I need to explain from here how to restore individual items,for that you can go to “How to Guides” at Veeam website. I Just want to point out that Veeam Backup Endpoint Free v1.0 is really free, How ?because it’s without support or as they love to call it “Best effort support”. They actually give you a good support when encountering that’s a free product for now. I’m feeling exhausted now 🙂 But you can’t go directly to the end if you didn’t do some explaining on how things work/ I hope it was more insight full than exhausting. This entry was posted in Veeam and tagged DATA protection, DRP, ENDPOINT protection, ITEM restore, VBEF, VBR, Veeam, Veeam Certified Engineer, vmbackup, VMCE, vmware_Veeam by Tal Shatz. Bookmark the permalink.